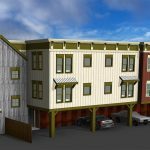 Anthracite Place is a proposed 30-unit affordable housing complex located at 513 Belleview Avenue in Crested Butte, Colorado. The project’s location is a prime spot for workforce housing, as it’s surrounded by amenities within walking distance such as a grocery store, an arts center, nearby parks, and a bus stop across the street. The project has secured low-income tax credits which helps make this project a reality and keeps working people living in the town of Crested Butte.